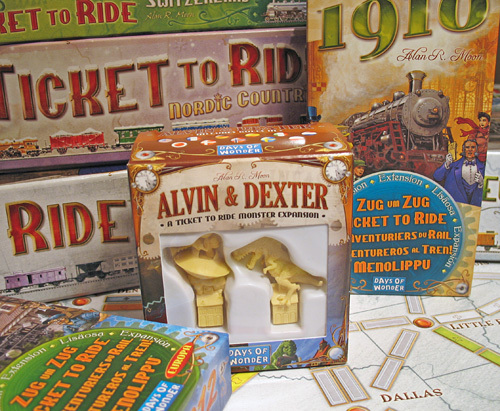 Back in February, I wrote a review for the Ticket to Ride Alvin & Dexter Monster Expansion. Frankly, Amy & I really like this tiny expansion because it adds more depth to any TtR game. At the time, I cross-posted my review to the highest-traffic boardgame website, BoardGameGeek.com. There's an internal "karma" system there that allows members to give "Thumbs Up" to posts they like or recommend. Small expansion, but very fun! I'm happy to say that my review has reached "100 Thumbs" on that site, which is sort of a big deal (well, I'd like to think so!) I hope that my writing at least helped steer some folks towards checking out Alvin & Dexter; it's a goofy expansion idea, but I think it's a hidden treasure!